This was a book that calico_reaction was kind enough to pass along to me earlier this year (I’d like to pay it forward and pass it along to someone else, but more on that later). I read this during the 24 hour readathon this past weekend. The cover is also gorgeous. I love this cover design – the pale colors against the black, the gray spots, even the font of the title and author’s name. The cover for the second book looks equally dreamlike and lovely. The Premise: The narrator of this young adult paranormal is Dana Hathaway, a teen who is sick of dealing with her alcoholic mom. When her mom arrives at her recital sloppy drunk, Dana has finally had it. She knows that her father, Seamus Stuart, is Fae and lives in Avalon, an independent city-state in England. Dana calls him and before long she’s running away to Avalon to stay with her father. Although Dana’s mom told Dana that her father was something of a bigwig, Dana doesn’t realize how big or that her arrival in Avalon would make her the target of political manipulations from pretty much every faction you could think of. My Thoughts: This is a pretty fast read. It’s only 294 pages but it moves quickly. I was surprised by how quickly I got through this one during the readathon. It’s in the first half of the book that I hit most of my problems with the story. That’s unfortunate, because I found the second half much better. The biggest issue I had was with Dana herself. I found myself repeatedly wondering why she didn’t ask more questions! First, Dana decides to run away from home, but doesn’t question why her father was OK with her going to Avalon without knowing how Dana’s mother felt about it. When Dana arrives, she find out that her father is in jail. Dana never asks what her father was in jail for and just accepts that he will be there a couple of days. I found that incredibly surprising. I also found it surprising that she knew who her father was but didn’t bother to find out as much about him as possible. She didn’t bother to google him, she didn’t bother to research into her heritage or to ask him about her other relatives? She had no questions about being half Fae? I could go on. It was incredibly naive, and as a result she looks like a fool when she learns that her father is in the running for the Council (Avalon’s governing body), that she has an aunt, and that there are possible complications in being half-Fae. What made this worse was that the naïveté contrasted sharply with Dana’s upbringing. Her mother is an alcoholic and it’s clear that Dana has had a lot of responsibilities thrust upon her. Dana is used to a mother who lies to suit her own purposes. You would think that this would make Dana wary of being lied to. Yet, she’s very gullible when she gets to Avalon. It bugged me to see how she reacted to obviously suspicious behavior. For example when strange people burst into her room, Dana notices the intruder’s pretty eyes and is disappointed when he (a young Fae named Ethan) is clearly chummy with the girl he brought. Then chastises herself .”Why on earth would I care?” – YES, why on earth would you care about this when this strange guy just broke into your room? To compound this, when Dana becomes friendly with Ethan’s sister, Kimber, she is warned about Ethan, yet Dana continues to lose all sense. When she’s betrayed – yep, that’s a big ol’ surprise to her, but not the reader. It was frustrating to read about these initial mistakes. Thankfully Dana learns some lessons, and in the second half of the book and she finally begins to question people’s motivations. Once this happens, I found her a much less annoying and could just enjoy the story. At this point we’re also introduced to Dana’s father (finally out of jail), along with Finn, a Fae Knight who acts as Dana’s bodyguard, and Keane, Finn’s son who teaches Dana some self defense. I liked Dana’s interactions with these characters a lot better than her interactions with characters in her first couple of days in Avalon. Dana’s dad takes honesty to painful extreme, but we do get the feeling like he is being honest and that he acts like a parent. He has rules and boundaries that he makes clear to his daughter. There’s still a question of who should be trusted and what everyone wants from Dana, but at least Dana knows this. It’s too bad that it took half the book to get to this point. Dana’s mother’s alcoholism is a big part of the story (it’s why Dana left her, and is said to be the result of Dana’s mom’s stress of leaving Avalon), and I want to put in my two cents about the way it was depicted. What I thought worked: Dana has a conversation on the phone with her mother who had been drinking and Dana can tell. The description of her mom’s clear but slightly sleepy-sounding voice and indignation at being called out do fit. Dana wanting to blackmail her mother into going into detox and her father telling her that that would not work was also true to life. What didn’t work so well: I already mentioned that Dana not having a very good lie detector didn’t seem to mesh with dealing with her mom. I also thought that if Dana is so used to hiding what’s going on at home, she would have a better poker face than she did. Lastly, Dana’s dad said that Dana’s mom didn’t drink any more or less than anyone else and she must have become alcoholic after she left Avalon. I don’t think this is something where someone can be “normal”, then after some traumatic event become alcoholic. I think it’s always there. When this book was done, I think what we have is an introduction to a series. Dana’s heritage and particular talents are established along with the possible political ramifications it could entail. Avalon and the factions within it are set up. And so is a potential love triangle between Dana and the two boys close to her age – Ethan and Keane. I think that I’m in the Keane camp because I found Ethan on the swarmy side (and it’s a big warning sign that his sister is telling Dana to watch out). Keane seems to be pretty up front in comparison and I liked how Dana was around Keane. I’d like to see where that goes and also to see what else Dana finds out about being half-Fae, but I’d like to avoid the naïveté that I saw in the first half of this book. I also had the impression that the plot could have been tighter (the climax has a cartoony evil villain wants to rule the world feel). I think I’d wait and read the reviews before picking up the second book (Shadowspell). Overall: It falls in the “OK, but I had reservations” camp for me. The second half balances off a pretty poor beginning, which is hampered by a teen protagonist who fits an overly naive, silly girl stereotype. Dana improved a lot by the end of the book, but ultimately this feels like a set-up-for-a-series book. Although my review shows I had problems with this story, I know others may not have the same kind of reaction. I’d like to pass it forward. If you are someone with a book blog who is willing to review this book, let me know and I’ll send it along (first come, first served). The book has been claimed! 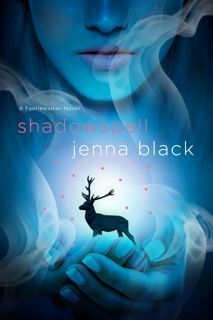 This entry was posted in book review and tagged jenna black, paranormal, series, young adult by janicu. Bookmark the permalink. I tried to read something by Jenna Black a few years ago but didn’t really take to her style. This one would be a pass for me, but I like the “pay it forward” thing you got going. I found a mix of reactions to this one and I think the main character has a lot to do with whether you end up liking it. I remember Calico having some reservations as well. At the time, I was more interested in reading it, but now I’m not too sure! I might give it a try in the future. I thought she has some reservations but when I look at her review, I think I had more complaints than she did. Mine were all about how Dana was at the beginning of the book. It really is too bad that this was at the beginning, because the second half – I didn’t find her annoying at all! Anyway, It’s all about the reaction to the main character I think. Feel free to use that idea! I think that the whole point of emphasizing the foolishness of Dana in the beginning was so that later in the book we can see character development, which we definitely did at the end of the book. We can see where she stops being so trusting when Ethan and even Kimber are introduced. Although it took half of the book to accomplish, I liked it. I think it is more realistic because changes that dramatic don’t happen overnight. Plus, I like the fact that Dana is so naive. It’s humanizing. Mm, I suppose you could look at it that way.. I do LIKE that there IS a change for the better in Dana, but I can’t really get over how foolish she was in the beginning. I think that I’m at this point tired of reading YA with a female main character who kind of acts like a stereotype of a teenage girl, instead of someone that felt realistic, so Dana felt like yet another one in that vein. I am glad that there ended up being more to her, I just wish the evidence of that came earlier.